Rahul Dravid: Top scorer for RCB in 1st 2 seasons of IPL comes to bat at no.7 - Shame! Top scorer for RCB in 1st 2 seasons of IPL comes to bat at no.7 - Shame! Most of you would agree that Rahul Dravid's batting position is not what he deserves to be at. How can RCB team management forget their top scorer in 1st two seasons? Rahul Dravid has got chance to bat only 3 times out of 8 matches, which is something every Rahul Dravid fan would get angry at. Of course, the team management will come up with a strong reason that RCB is winning without Dravid getting a chance to bat , so why change the order? We have to agree this reason with "big" heart. Kallis is in tremendous form, Uthappa and Kohli are making consistent contributions, so why change their batting positions? In that case, why not bring Dravid in place of Pandey/Pietersen or others? What I think is that Rahul Dravid should open the innings with Kallis on tricky wickets like Delhi, Bangalore, Mohali and Mumbai. Kallis, who is in good touch, should go after the bowling and The Wall should play the role of anchor. 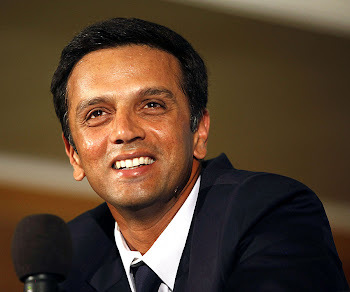 On the flat tracks, Dravid's batting position will depend upon how quickly the wickets fall. If the situation demands him (like 14/2), he will for sure make good contribution. If RCB is going good, team management can utilise the talent (!) of Uthappa, Kohli, Pietersen etc. Let's see how the strategy goes for RCB. They have got powerful batting lineup, but lacking the killer mindset in bowling. It will be a tough week for RCB when they will be facing DD, DC and KKR. Good luck RCB!